Hello, finally its done. During the last summer I worked on my first DIY steering wheel for the Mercedes AMG GT3. 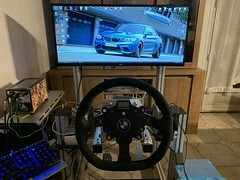 Basically its a mixture between the GT3 and DTM steering wheel, kind of The diameter is 30 cm since the Fanatec Formula rim is too small for those cars. 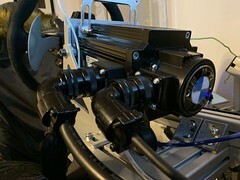 The rim is mounted on a Fanatec Universal Hub. 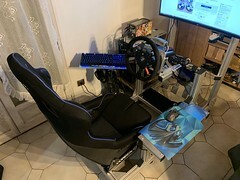 The customer support of Fanatec was also very nice. 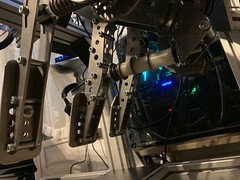 I could not find the right connectors for the mainboard of the Hub. First I tested JST connectros which I found at Ebay but they were to loose in the sockets and didn't work probably. 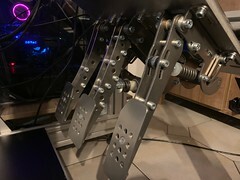 After contacting Fanatec I luckily got the original connectors, no loose connections since then. Overall It works really nice, the wheel feels really nice. At the beginning I haven't thought that it will take such a long time to develop such a project. But it was definitely worth it. I hope this project might inspire you to do your own projects. You should sell them i would Buy 1 in 1/2 a Heart Beat!!!... I have a u universal Hub PM Me if you want to Make and sell the extra Wheel rim!!! Hey, GrimeyDog so far I haven't thought about to sell the rim as a kit, or parts, or CAD drawings. 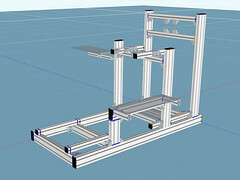 CAD drawing and handles would be possible I guess, have to think about it. I printed the handles at shapeways. Even though they are hollow they were quite expensive to print. I think the handles were around 120€. I also printed the cab in the middle of the tim for the star and 6 washers for not to scratch the rim from the backside. Thw washers look identical to the ones from Fanatec. 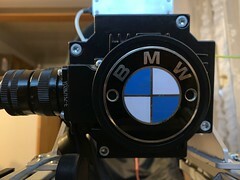 The rim was laser cut from 4 mm aluminium. I have thought about carbon fibre but couldn't find a company to do it. Carbon fibre isn't actually necessary I think it just a matter of taste. First I tried to spray the aluminium but this didn't really work out. The result was just too damagable. Then I looked out for companies who could anodized the rim in black. In the end the rim is not anodized but treated with another chemical method. I have forgotten the name for it. The rim is not glossy it has a semi gloss finish. The 6 holes for the screws are countersunk. The company who did the laser cutting did the countersunks as well. Unfortunately, I don't have a workshop at home to do this kind of works. To countersink the holes is not really necessary, but I wanted the cap to be as flat as possible. wow, that looks nice ! Got to check your website. i never paint my wheels myself...Mercedes aluminum or hydropaint wheels paints in a professional car paint workshop.They have primer coating and then electrostatic painting. I know your more into building wheels more towards direct drive, but was wondering if fl0wf1r3 is unable to go down this route, maybe you could, to me it makes sense being able to make rims like this to attach to the Uni Hub, could be done as a kit, especially 300mm GT3 rims, just a thought. 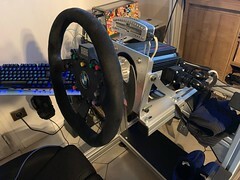 I think I mentioned to you awhile ago now, I would love for someone with the ability to strip down my Fanatec F1 rim and build a GT3 rim to contain all the workings, ever fancy using it for that we should talk..
with #amstudio tutorial will be very simple. Choose your "structure", for example, you can start with a real hydraulic HB. Or you can work a simple bar, stick, rod or whatever you look like! Yes I've seen that, very good videos, he uses a 3d printed part which is very neat. 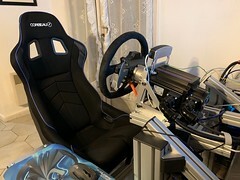 I will probably just use the g27 pedal and some aluminium tubing or similar. Ive got various springs and foam inserts to make it feel decent. It peoples own opinion on the distance and how they use the game view, it's the same as fov everyone has their own taste. Agree, but with fov there's a right and a wrong, even if some people won't admit it. If I set my fov at the recommended setting for my screen and distance it looks awful and driving is horrible, it's like you in slow motion and driving the car becomes so over sensitive also it's not natural to the eye.